Last rehearsal before the Arc de Triomphe! 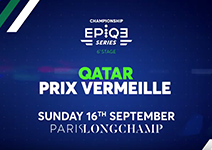 Rendez-vous on September 16, 2018 on the racecourse Parislongchamp for the Qatar Prix Vermeille. An excellent springboard to run the Qatar Prix de l'Arc de Triomphe and a perfect moment to make the difference in the championship for the jockeys. A race that will keep all its promises.